"This is a twist on the classic Greek sandwich." Whisk together the olive oil, cumin, garlic, marjoram, rosemary, oregano, red wine vinegar, salt, and pepper in a large glass or ceramic bowl. Add the venison strips, and toss to evenly coat. Cover the bowl with plastic wrap, and marinate in the refrigerator at least 2 hours. Heat a large skillet over medium-high heat. Cook the venison strips, a half pound at a time, until the venison has browned on the outside and is no longer pink on the inside, about 8 minutes. Pile the meat onto warmed pitas to serve. 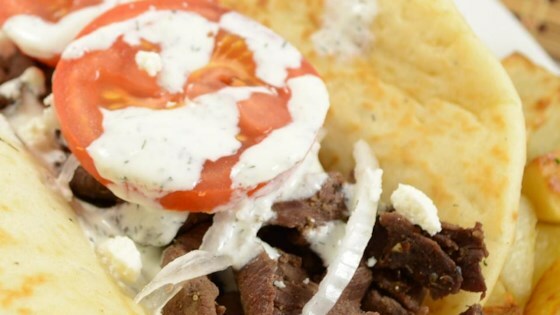 Wholesome, delicious and demystified gyros from Chef John! Just overall blah. This is the first dish I have made and the whole family didn’t like it. This is not a dish I’ll be holding onto! This recipe rocks..... Used antelope instead of deer and it was awesome. Make cucumber gyro sauce to go with it. Both quick n easy.